People's Alliance leader Kris Austin says Ambulance NB's 'success rate is not accurate,' citing a policy that allows the service to eliminate some delayed response times from its reporting. People's Alliance leader Kris Austin is challenging Ambulance New Brunswick's claim it is meeting response times for 911 calls. The emergency service says that in 90 per cent of calls, it responds within nine minutes in urban areas and within 22 minutes in rural areas. But Austin says those figures are distorted because of an exemption in the ambulance service's policy that allows it to eliminate some delayed responses from its reporting. "The success rate is not accurate," he said to CBC News on Tuesday. "Recently, I found out, because of these exemptions, it greatly skews the numbers Ambulance New Brunswick is releasing to elected officials municipally and to the public at large." Austin's claim comes after a 14-year-old girl died Aug. 11 in a crash near Saint-Quentin. The town's volunteer fire captain, Martin Pelletier, told Radio-Canada it took 45 minutes for an ambulance to show up to that accident. The exemption Austin describes comes from an internal Ambulance New Brunswick policy he obtained and provided to CBC detailing "response times that exceed contractual standards." One valid reason for a delay is distance, the policy states. Austin says Ambulance NB uses these exemptions to make its track record look better than it is, because a delayed response approved under one of the conditions is not counted against its success rate of 90 per cent or higher. 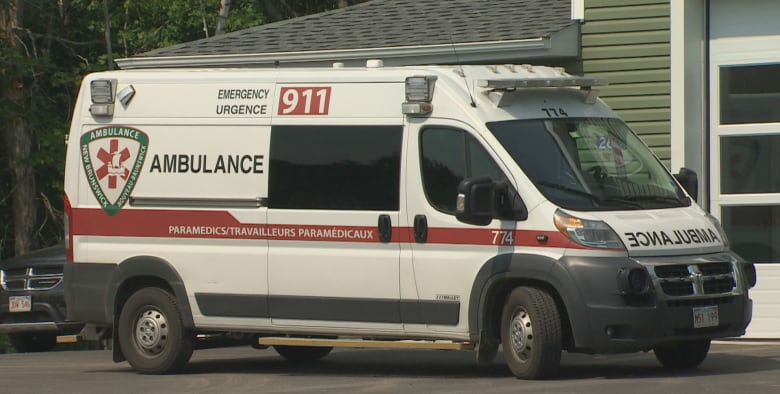 Because some delayed responses do not need to be accounted for in Ambulance NB's official success rate, Austin said, it is not representing the experience of rural New Brunswickers. "We've heard stories about ambulances taking a long time to get to some of these rural areas but are never able to peg it with the data," he said. "Now that we understand that indeed there is these exemptions, now it brings to light that these stories we've been hearing are indeed accurate." Exemptions to the Ambulance New Brunswick response files must be approved by the provincial government on a monthly basis. Austin said regardless of cost, the provincial government needs to provide more funding to the ambulance service for rural centres. Janice Michaud echoed Austin's statement. She called 911 from the Chipman Waterfront Campground on Saturday seeking help for somebody who was having difficulty breathing. She called 911 at 11:39, according to her call history, and said it was 12:19 when the ambulance arrived — meaning the ambulance was over its target by 18 minutes. Michaud was told by dispatch it was because the ambulance had to come from Doaktown. The ambulance that usually services Chipman was busy. Luckily, Michaud said, the incident turned out to be not life-threatening to the victim. "It's ridiculous," she said. "If it had have been life or death, if it had have been someone having a heart attack, a child choking, someone drowned, it could have been a really different outcome." Other residents of nearby communities expressed dissatisfaction when asked about the ambulance service. "Not efficient or sufficient," said Minto resident Barry Boudreau. "They're downsizing the ambulance base to a single ambulance and I don't see how this satisfies the need for this community." "I think it's shameful," Carrie Knox of Chipman said,. "They should have more ambulances out here." Austin said this has been the tone in rural communities since he was elected deputy mayor of Minto in 2012. "I think regardless of the cost, lives are literally at stake," Austin said. "We're not talking about the backroads woods, we're talking about rural communities." Ambulance New Brunswick has not responded to Austin's claims.